A shimmering sea of polythene has consumed the small coastal plain of Campo de Dalías, some 30 km southwest of the city of Almería in southern Spain. 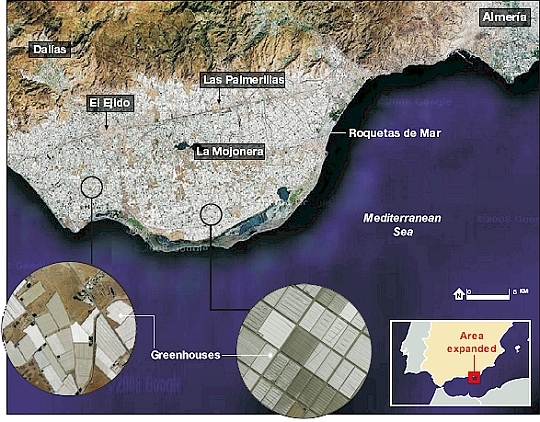 Almería has become Europe's market garden and to grow food all year, the land is cloaked in plastic. There are now an estimated 40,000 hectares of greenhouses in the Campo de Dalías, the largest concentration in the world. Over 2.7 million tonnes of produce are grown on the plain each year, accounting for over €1.2 billion in economic activity. The largest greenhouse producing areas in Europe are Spain (46,000 hectares), Italy (25,000 hectares), France (9,500 hectares) and Greece (3,800 hectares). In the image below from 1974, mixed land use including urban development and agriculture occupy the Campo. Table grapes were produced on wire trellis systems and covered with plastic to induce early ripening for shipment to the European markets. Some growers began growing vegetables, and because of the greater profitability, most, if not all of the grape production quickly disappeared during the 1970s and 1980s. Agriculture shifted from open fields to greenhouse production of early and out-of-season vegetables. From the lens of a passing satellite today, Almería province is one of the most recognisable spots on the planet. The roofs of tens of thousands of closely packed plastic greenhouses form a blanket of mirrored light beaming into space. Production of these salad vegetables has increased because of several factors. When Spain joined the EU in 1986, it was able to export food products to European markets tariff-free. Changes in diet have contributed to an increase in vegetable consumption in Europe, opening windows of opportunities for vegetable growers. Greenhouse construction costs are low since many of the greenhouses are homemade and all are primarily made of plastic. Innovations in transportation have improved quality and lowered costs in shipping vegetables. Favourable physical factors: climate, soil, and availability of water resources in the subsoil. The area has a dry, mild, Mediterranean climate and is further sheltered on the north by the Sierra de Gador mountains. With just slightly more than 200 mm of annual precipitation to support crop growth, the area also relies on groundwater fed by small stream aquifers from the mountains to the north. Almería has an average temperature of 20°C and about 3000 hours of annual sunshine. Salad vegetables can be grown during the winter months without having to use expensive heating systems as in other places in Europe (e.g. Holland). Government support provided infrastructure, technical advice and sources of funding. The accidental discovery of the cultivation technique of sanding. The know-how of the first immigrant farmers with experience in this type crop. A young and abundant workforce, with an enormous capacity for work and low risk aversion. Low labour costs. Labour costs are one third of those in the Netherlands. Most of the producers are small family-owned greenhouse operations and have low capital investments, generally producing on a site of 1-1.4 hectares in size. The family companies generally retain low labour costs and have a strong motivation for work. Production and labour requirements are seasonal. The crops are grown continuously from October to July, with production peaks in December-January when tomato, cucumber, green beans, and pepper are harvested, and then again in May-June when melons are in season. Tomatoes and sweet pepper represent the greatest crop area, followed by melons. Producers use a lot of temporary labour, especially from north Africa, Central and South America. Certain eastern European groups are also migrating to southern Spain for work. There have been recent clashes between growers and mainly Moroccan immigrants, due to poor working and living conditions for foreign labourers. Several growers have faced strikes, and labour issues appear to be some of the greatest problems facing producers in the area. Approximately 90% of the greenhouses use an artificial soil called Enarenado in order to overcome the extremely poor indigenous soils of the region. This is a soil mix of clay, manure and sand that sits on top of the original soil base. In the remaining greenhouses, plants will never touch soil - they grow using a hydroponics system where chemical fertilisers are drip-fed to each plant from large, computer-controlled vats. Water quality is a prime factor in determining the price of land in Spain. Greenhouse production has a requirement of 800-1000 mm per year in a region that receives just 200 mm of annual rainfall. Water efficiency has improved dramatically, especially with the use of drip irrigation, and a new seawater desalination plant opening in 2009 will supply 60,000 m³/day of fresh water to the region. Almería has a comparative advantage over northern Europe with production costs less than half of those found in Holland. Energy costs are low, greenhouses are often homemade and labour costs are one third of those in the Netherlands. Transport costs, however, are nearly doubled, leaving total costs for production and transport 20% less than those in the Netherlands. Supermarkets British supermarkets are secretive about how much produce comes from Almería. Tesco calls this "commercially sensitive information". But Rafael Losilla, editor of a local farming magazine, names Tesco, Waitrose and Sainsbury's as valued customers. "Britain is the third-biggest export market after France and Germany," he says.